In the last installment, we admired The Legend of Zelda: Ocarina of Time. There were collective oohs and aahs, like we were attending some kind of nerdly gaming fireworks display. Because Ocarina is just that beloved by players and critics. Not all of them, naturally. It’s impossible to please everybody in any walk of life, perhaps especially the gamertastic (you know the philosophy of the Internet, I whine, therefore I am, after all). 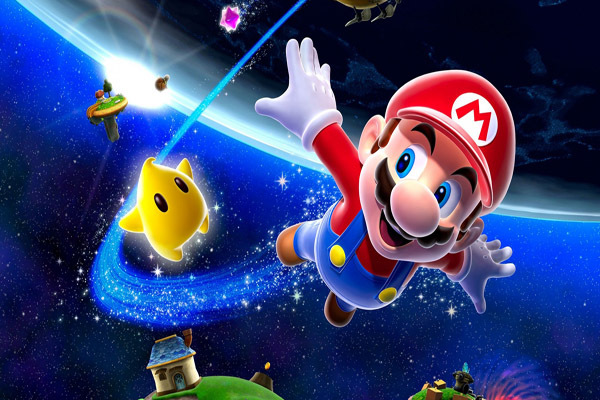 But we’re looking at the most celebrated games here, and the best-reviewed of all time –according to gamerankings.com– is Super Mario Galaxy. The hype was strong with this one, there’s no doubt about that. This much ballyhooed Wii release was Mario’s first for the system, and it had the full force of the franchise to live up to. Super Mario 64 was among the most prestigious platformers ever made, and was the game that thrust our ol’ moustache buddy into the third dimension. But hell, that’s a classic for another day. All we’re concerned with just now is: how do you top that? 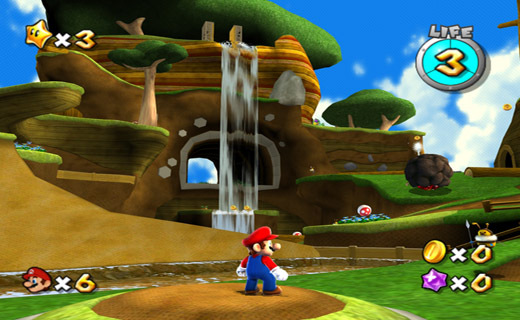 The N64 launch game added a liberating sense of scale and freedom, with its big ol’ mountain slides and vast castle hub. The Gamecube’s Super Mario Sunshine was quite the curve ball, sending us a-platformin’ across the verdant tropical paradise of Isle Delfino. Thinking big has been the key for the series’ designers. And what’s even bigger, more ambitious, than these huge worlds? Outer darn space, that’s what. Because if a world is vast, a galaxy must be vast..erer. Wasn’t this a sight during the previews/screenshot/sneak peeks phase? Prior to its release in November 2007, there was a lot of anticipation about this odd new direction Mario was taking. The Mushroom Kingdom was nowhere to be seen. The hub would be the Comet Observatory, from which we would transported to planets, moons and satellites across the cosmos. It was all shiny and new and exciting. After all, Mario has only rudimentary knowledge of space travel. It isn’t his domain at all, as the franchise hasn’t really ventured into that area before. Beyond the fleeting Space Zone in Super Mario Land 2: Six Golden Golden Coins, that is. You would think it’d be an idea at odds with the games’ legendarily brightly coloured, toon-tinged funtimes. The endless black bleaky blackness of space is an odd fit in this vibrant cartoon world. But wow, does that juxtaposition work. It’s rather a gimmicky concept, and running across those rotate-y planets and asteroids is a strange feeling at first. But then you’ll encounter the giant goombas on the supersized world, or the thwomps, and you’ll wonder why they didn’t think of this before. As is the case with the other 3D games in the series, there are no ‘levels’ as such. Instead, you are exploring the same locations with a different objective, and this is the key to Galaxy’s success. Whatever you may think of Super Mario, the quality of its platformery –because that’s a thing– is pretty well unrivalled. As the genre goes, they are always polished to a delightfully shiny shine. What Galaxy did was literally take this to a place the series had never been before, and try to enhance that sense of wonderment, grandeur, freedom and plain fun the mascot stands for. It will only take your first joyful journey on a Launch Star to see that they succeeded.